On Tuesday, January 25, Oakleaf celebrated the grand opening of its new headquarters with a ribbon cutting ceremony followed by guided tours. While the old location served the company well for an important period of time, it limited future business development. The new location at 415 Day Hill Road, in Windsor will better serve clients, employees and create more jobs in the State of Connecticut. The relocation was facilitated by a $3 million relocation and development grant from the State of Connecticut in July 2010. In a letter of congratulations, Governor Dannell Malloy stated: "The event is highly significant for the town of Windsor and the State of Connecticut. We are proud of Oakleaf's business growth, excited about its future and encouraged by its decision to relocate within the state of Connecticut." At the event, Oakleaf President and CEO Steve Preston stated: "The design of the building is bright and open with plenty of natural light to create a positive work environment. Collaboration tables are sprinkled throughout and there are multiple nooks where people can come together. White boards are located in multiple hallways and there is plenty of meeting space - helping the team operate and collaborate more effectively." Additionally, a number of green building elements were incorporated into the building's design. Carpet, ceramic tile and cafeteria counter tops were constructed using recycled materials. Also, remanufactured workstations were installed, preventing 250,000 lbs. of material from going to a landfill. Preston continued: "The new headquarters coincide with Oakleaf's new philosophy: Intelligent Waste Management, which is an expression of the sophisticated, smart solutions Oakleaf brings to the Waste Industry." More than 300 Oakleaf employees, vendors, dignitaries and stakeholders, attended the outdoor ribbon cutting celebration. Special thanks were extended to Amenta/Emma Architects, Cushman and Wakefield, BKM and Davies Office Refurbishing. Notable speakers at the event included: Town of Windsor Mayor – Donald Trinks, MetroHartford Alliance President and CEO – Oz Griebel and CBIA President and CEO – John Rathgeber. Notable attendees included State Representative Elaine O'Brien and Town of Windsor Councilor Mike McDonald. Founded in 1995 and headquartered in Connecticut, Oakleaf provides the first-to-market, asset-light business model with unparalleled technology for some of the largest, most progressive, environmentally-minded companies in North America. 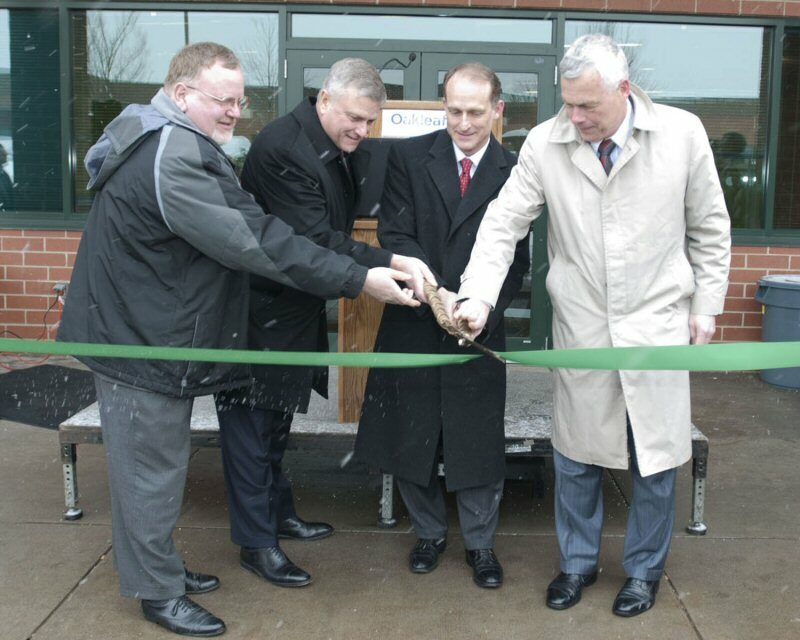 From left to right: Town of Windsor Mayor Donald Trinks, CBIA President and CEO John Rathgeber, Oakleaf President and CEO Steve Preston and MetroHartford Alliance President and CEO Oz Griebel - cut the ceremonial ribbon at Oakleaf's new headquarters: 415 Day Hill Road, Windsor, CT.